Here's the second look of my August Remix series featuring this adorable printed skirt from Target! If you missed the first post or want a refresher, here it is! I know summer is kind of drawing to a close, but I'm milking the rest of the warm weather as much as possible. However, one of my favorite pieces to transition between seasons is a chambray shirt. I see a chambray shirt remix coming up in the coming months...any interest?? 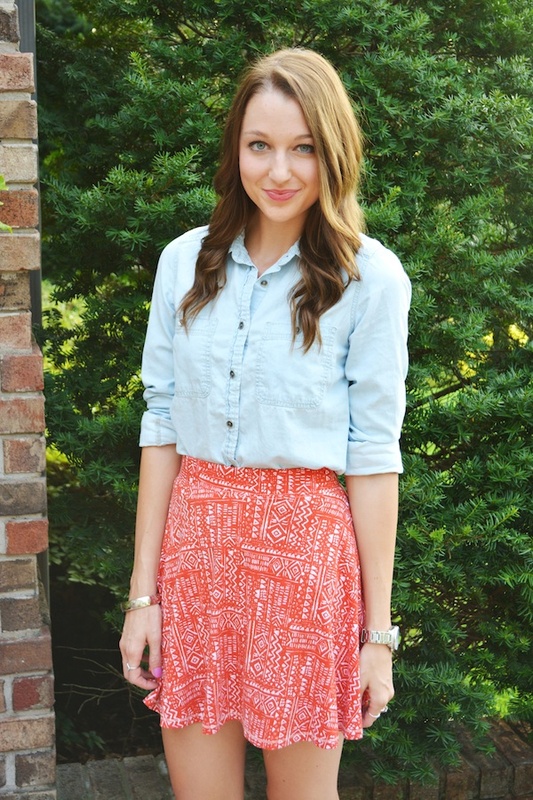 Its such a great idea pairing a fun printed skirt with denim shirt, really changes the entire feel and look. Great styling! Love that shirt! I'm a total sucker for chambray!! Adorable! I love this skirt! Cute, I love this classic combo. What an adorable skirt! I don't know how I missed it at my local Target! Love the skirt and the way you paired it with the denim top. Me encanta tu falda!! Tiene un estampado precioso!! Thanks for your comment doll, I have added the Lucky cover just for you now :) have a splendid weekend! I am loving that skirt, such a great outfit. And you have amazing legs! Jealous.